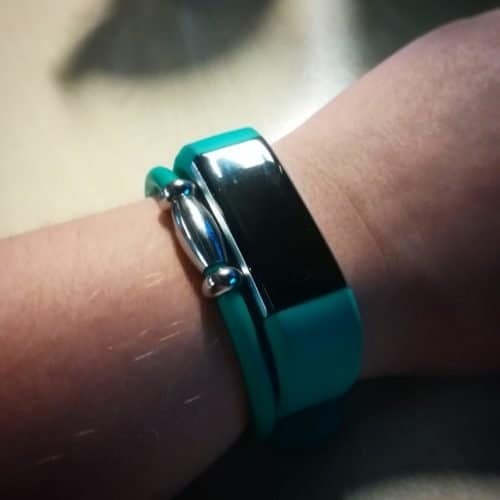 Lots of you have been reading my review of my green Pegasus Vitality Bracelet recently. But when I had a quick look at where a lot of you were finding this review, I could see that you were looking for answers to some quite specific questions. Very few of which I actually answered in my review. So I thought I would create a second post to hopefully answer some of your burning questions, such as how to wear the Pegasus Vitality Bracelet. Pegasus recommends wearing the bracelet so that the clasp is on one side and the two moving balls are on the other side of your wrist with a bit of space between them. Like in this photo. They also recommend having the clasp on the top of your wrist with the two balls on the underside of your wrist. But some of their customers have found good results from having the clasp on the underside. I tend to have mine with the clasp on the top of my wrist but the balls just wherever they sit. Mine do tend to move around quite a bit during the day. But this isn’t a problem as there is no research to prove if wearing the bracelet one way is any better than another. Just find out what is comfortable for you and maybe play with different positions to see if any feel better for you or not. Can I wear it next to my watch? Yes. While the magnets are great for you. They shouldn’t interfere with your watch or any other technology. Will it interfere with my phone/laptop/etc? As above, it shouldn’t affect your technology at all. Do I need to build up my time wearing it? Unlike when using magnetic therapy on your horse, you don’t need to build up your time wearing it slowly. You can put it on straight away and wear it constantly. Pegasus Jewellery recommends wearing it 24/7 for the best results. I wear mine all the time only taking it off when I get in the bath. Is it okay if it gets wet? Yes (unless you have the leather one!) Water will not damage the magnets or the metal or silicon bands. However, salt water and/or chlorine could potentially fade the colour of your silicon bracelet. So I could recommend removing before going swimming or having a bath. I always take mine off if I am swimming or washing. For more information on the vitality bracelets and other magnetic products, visit the Pegasus Jewellery website. They have also just released NEW magnetic products in the form of earings and clothing clips! It’s interesting about having the clasp on top, I have the leather plaited one with the bit shape on it. I would have never thought of putting the clasp on the top of my wrist because it wouldn’t look right. Maybe I’ll give it a go! I keep meaning to buy one of these but always forget!! They are fantastic! I’ve had mine on for about 3 months now and I do seem to be coping a bit better with the winter blues and dark mornings.